Barba gamble starting to pay off. Chairman Eamonn McManus took a king-sized gamble when he approved the signature of Ben Barba on a two and a half year deal last May, knowing the Aussie full back was still serving a 12-match NRL ban for a cocaine-related offence and unable to play in his chosen sport until the back end of the season. Some questioned the wisdom of the decision but it is already proving spot on - just like it was when he plucked Jamie Lyon from the backwaters of the 13-a-side code Down Under after he had become disillusioned with the pro game. Like Lyon, Barba’s career seemed to be going nowhere but if it treads the same path as his Aussie predecessor, then McManus will have pulled of his second master stroke of the 21st century. During his short stay at Knowsley Road, centre Lyon achieved Grand Final and Challenge Cup success, as well as being named Man of Steel in 2005. He also scored 46 tries and kicked 213 goals in more than 60 appearances for the club before returning home and resurrecting his career. It’s an impressive record, and although Barba doesn’t kick goals, it his hoped he can match his fellow countryman in terms of try scoring. 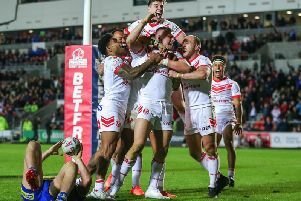 Catalans Dragons and establishing Saints as one of the early pacemakers. Barba has also scored two tries, helped create another five and gone for 257 metres. He has also busted 18 tackles. It’s his reward for resuming pre-season training earlier than quite a few of his colleagues and a point not lost on fellow Antipodean Zeb Taia. Zeb only arrived at Saints last February - missing all the pre-season training - but like Barba is benefiting from his winter session which was clearly illustrated when he scored two tries in a Saints’ shirt for the first time in the win over Castleford. And he knows a fighting fit Barba will be a key component in a Saints’ side aiming to make an impact in both Super League and the Challenge Cup. “Ben will be a massive threat to other teams and always picks the right plays. Saints fans will be thinking the same !